There is full employment in Penang. This is a good sign indeed, especially when the rest of the world is in an economic crisis. The challenge for the state lies in attaining and maintaining a high-skill workforce. Inflows of investments into high-technology manufacturing and knowledge-intensive services increase the demand for quality high-skill labour, and labour competition is the fiercest at the high-qualified spectrum. Measures to minimise quantitative and qualitative mismatches of skills are crucial if fresh graduates are to have the right skills needed for future industrial development. Continued human capital development is therefore necessary to move Penang and Malaysia towards becoming a high-income nation. Importing foreign talent to train the existing workforce should be seriously considered, and universities should establish career centres that work closely with employers to provide students with up-to-date information about employment opportunities. An economy’s rising competitiveness is generally signposted by a sustainable and strong human capital development. Towards this aim, student enrolment in Malaysia over the last three decades or so has been expanding, facilitated by the sharp increase in the number of public and private universities in the country. The aim has been to hit the Vision 2020 target of having at least 21% of the national labour force possessing tertiary education. However, while Malaysia’s tertiary-educated workforce quantitatively skyrocketed to 27.7% in 2016, the lack of soft skills among the graduates, as pointed out in the National Graduate Employability Blueprint 2012-2017, is cause for worry. The country appears to have shot past its target, and many worry about the employability of many of these graduates. Apparently, their acquired skills are inconsistent with industry needs, and have left a sizeable number of them without a source of income. In Penang, the industrial sector has been an important source of employment since the 1970s, and its workforce had moved from agriculture and trading activities into export-oriented electronics manufacturing operations. As the state turned into one of the largest electronics manufacturing hubs in the world, multinational companies upgraded their facilities as technologies developed. Industrial 4.0 is the next wave of manufacturing upheaval, and more human talent in the fields of automation, artificial intelligence and Internet of Things (IoT) is acutely needed. Using Penang data, this article examines employment trends alongside other labour-relevant issues. Penang’s employment condition has been stable over the past two decades. Prior to the 1997 Asian Financial Crisis, the state’s labour force participation rate was growing below the national rate but has since then surpassed it. It rose steeply during 1996-97, from 60.6% to 68.2%. In 2016, it continued steadily at 69.0% (Figure 1). This suggests that more of the state’s population aged between 15-64 years old is now participating in the labour market. Penang’s economic performance is influenced significantly, and to a greater degree than in other Malaysian states, by global economic events. The effects may not always be predictable though. Following the 1997 Asian Financial Crisis, and as the Ringgit was pegged against the American Dollar, foreign investment to Penang, instead of decreasing as one would expect, increased by more than threefold in 1997-1998 and employment in the state expanded annually by 6.6% during 1995-2000 (Figure 2). Although employee retrenchment was record high during the 2009 US Financial Crisis, and although many multinational firms carried out temporary shutdowns while some went through mergers & acquisitions, the double-digit contraction of 10.5% in the state’s GDP affected the unemployment situation surprisingly mildly. Source: Author’s own calculation from Labour Force Survey, Department of Statistics Malaysia. Source: Labour Force Survey, Department of Statistics Malaysia. Penang’s unemployment rate reached a historical low at 0.7% in 1996, and thereafter hovered between one to three percent, with a moderated rise of 0.5% in 2016 (Figure 3). During the global economic slowdown in 2009, the rate increased to 2.5%. Most developed countries adopt economic policies aimed at achieving full, or at least high levels of employment. The threshold for full employment , or the natural unemployment rate, has been widely debated among economists in assessing employment conditions in a country. The accepted definition varies across countries. Singapore regards 2% as its natural rate of unemployment; South Korea adopts 3.6%; and Hong Kong 3%. With its unemployment rate at around 2.1%, Penang can be said to have experienced full employment status since the 1990s. Much of the unemployment is frictional, expressing the interim period when workers are moving from one job to another. However, inflows of investments into high-technology manufacturing and knowledge-based services as well as the accompanying increase in demand for high-skill labour have put pressure on the labour market. Over the past two decades, tertiary-educated employed persons swelled by more than threefold from 8.4% in 1990 to 30.2% in 2015 (Figure 4). While secondary-educated hires have not varied significantly, primary-educated – and formally uneducated – hires have seen a sizeable reduction. This coincides with employees across the skills spectrum. The share of high-skilled employment increased by over three times from nine percent in 1990 to 29.2% in 2015 (Figure 5). Source: Author’s own calculation based on Labour Force Survey, Department of Statistics Malaysia. Interestingly, for the region, although the low-skilled employment segment shrank to 39.2% in 2015, it remains the largest proportion of employment in the region. Given that 46.5% of Malaysia’s foreign workers are employed in industries requiring low skills, these probably make up the largest proportion in the low-skill segment. Penang’s labour market is thus operating at full employment, and there are many vacancies going unfilled. According to JobsMalaysia.com – a job search portal governed by the Malaysia’s Ministry of Human Resource, Penang’s vacancy fill rate was recorded at being as low as 3.8% in 2015. The low rate of job placements occurring at a time when the unemployment level is low suggests that the labour market is tightening. Many economists believe that this will elevate wage inflation and thus help raise productivity growth. Employers will have no choice but to compete in hiring the best candidates by offering special perks packages. To some extent, employers will hire under-skilled candidates, and provide additional training. This competition is fiercest at the high-qualified spectrum. R&D and D&D are core activities in Penang-based foreign companies. This means that more public resources at the state and federal levels need to be invested into developing high-skill labour particularly to cater for the skills requirement of Industrial 4.0. Table 1 shows Penang’s approved manufacturing investments along with jobs created for the periods 1997-2007 and 2008-2016. Within these periods, total investment escalated by 73.3%, arriving cumulatively at RM59.2billion. Over 139,000 jobs generated within 2008-2016 accounted for about 17% of total employed persons in Penang. The Electronic & Electrical (E&E) industry continually is responsible for the largest proportion of investment, coming mainly from the US, China and Germany. In a constrained labour market (where demand for workers is higher than supply of labour), the job-seeker ratio – the number of unemployed persons available for a vacant position – is way below 1/1. Only 0.19 unemployed persons were available for every job opening in 2015 (Figure 6). One unemployed person actually had five vacancies to choose from, ceteris paribus. In other words, Penang lacks the workforce needed to sustain the number of jobs being created. Source: Author’s own calculation based on Social Statistical Bulletins, Department of Statistics Malaysia. On average, Penang’s public university generated about 8,282 graduates every year in 2008-2015; 10,127 mid- to high-skilled jobs were available in Penang on JobsMalaysia.com in 2015. This indicates a trend where there is an excess of demand particularly for mid- to high-skilled workers. With job creation envisioned as part of high-value added knowledge-oriented activities, there is an obvious need for companies to upskill employees. Skills-training providers feel the pressure to continuously upgrade courses and provide short programmes to cater to the needs of current employers and new investors. Investment promotion will become difficult to conduct if the talent required by the current industrial landscape continues to lag behind. Additionally, reskilling programmes are also essential for alleviating low-skilled employees to the next level. Automation is expected to be the next industrial revolution, and many tasks will soon be taken over by robots, and most manufacturing processes will be handled by increasingly automated machines. Just as importantly, programmes are vital to the raising of the income level of the poorest 40 percent of households. It is also this social group that will be most badly threatened by technology development. Job seekers tend to apply for more than one vacant position at a time. According to Malaysia’s JobStreet.com, in 2016, there were more than 100 applications on average for each vacant position in Admin & Human Resource, Engineering and Education & Training. In essence, employers should have had no problem filling positions. That was however not the case, and while job seekers were aplenty, recruitment difficulties persisted, both in the manufacturing and services sectors in Penang. The situation can be explained in two ways. First, “missed matches” occur when job seekers stay oblivious of job openings that suit their skills set. Although most job vacancies are advertised in JobStreet.com and JobsMalaysia.com, many that seek specific skills or managerial competences are largely handled by employment consulting agencies. And then there are the “mismatches”. Some job seekers simply lack the right skills for the positions they seek. The National Graduate Employability Blueprint 2012-2017 found that poor command of English among young graduates was the top hiring challenge faced by employers. Other major skill deficits in graduates included weak analytical thinking, bad problem-solving capability and poor communication abilities. In fact, in 2015 for example, 23.9% of 229,568 fresh graduates remained unemployed six months after graduation; and nearly half of these attended Art & Social Sciences programmes (Figure 7). The employment situation is worrying indeed when unemployed graduates are furthermore overqualified for available positions. 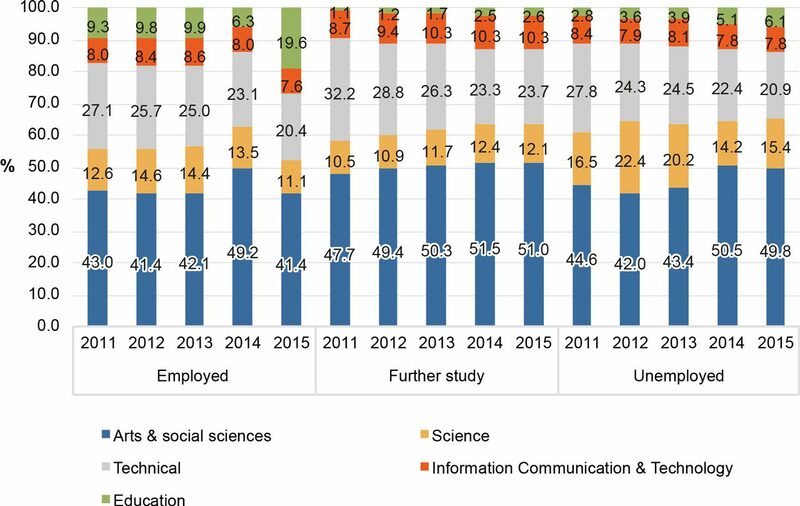 Between 2010 and 2015, while unemployed graduates with first-degree qualifications climbed marginally to 2.3%, those with master’s degree, PhD and postgraduate diploma grew substantially by five percent and above (Figure 8). This raises the question of how big the mismatch is between graduates’ education qualifications and the skills demanded by employers. Of 71,433 job openings in Penang offered in JobsMalaysia.com, merely 1.8% recruited for high-skill positions, and the large majority – as high as 85.7% – sought low-skill workers. One may infer from this that many graduates remain unemployed because they are overqualified for the low-skill positions. Source: Author’s own calculation based on the Graduate Tracer Study Reports published by Ministry of Higher Education Malaysia. In theory, “missed matches” can be minimised by making job openings more appealing to jobseekers. It is also important to have employment opportunities published at universities’ webpages. Universities and corporations should consider working closely together on this, and the career assistance centre on campus should also actively organise career talks and graduate grooming and guidance programmes. “Mismatches” would meanwhile require long-term policy and collaboration between government, university and industry to mitigate the gap between skills demand and labour supply. This gap can be appropriately addressed by introducing effective policies and instruments aim at lessening labour market bottlenecks. Industry players can also play their parts by sharing recent technological inventions and scientific discoveries with universities’ students and lecturers. Concluding Remarks Continued human capital development is therefore necessary to move Penang and Malaysia towards acquiring knowledge-based industries and achieving high-income status. Importing foreign talent to train the existing workforce should be seriously considered. Universities should establish a career centre to work closely with employers and provide students with up-to-date information about employment opportunities. They have to develop future-ready talent that matches both hard and soft skills requirements. Full employment denotes that practically all within the working ages being employed at prevailing wage rate. Groenewold, N. and Tang, S. H. K. (2004). The Asian financial crisis and natural rate of unemployment: Estimates from a structural VAR for the Newly Industrializing Economics of Asia. Pacific Economic Review, 9: 45-64. There are discrepancies as to the skills classes employed by the World Bank and the Department of Statistics Malaysia. In the World Bank, high skill includes legislators, senior officials, managers, professionals, technicians and associate professionals. Mid skill includes clerical workers, service & sales workers. Low skill includes agricultural, forestry and fishery workers, craft and trade workers, plant and machine operators and assemblers and elementary occupations. Meanwhile, the Department of Statistics Malaysia categorises elementary occupations as low skill, and the rest of the low skill categories are mid skill. This analysis uses the World Bank’s skill classifications. Ministry of Higher Education Malaysia (2012). The National Graduate Employability Blueprint 2012-2017. University Putra Malaysia Press, Putrajaya. World Bank (2014). Malaysia Economic Monitor: Towards a middle-class society. December 2014. The graduates’ employment status include graduates who are employed, further study, unemployed, having skills improvement and waiting for job placement within a period of six months after graduation. Next PostNext The Digital Free Trade Zone – A Path to Inclusive Growth?